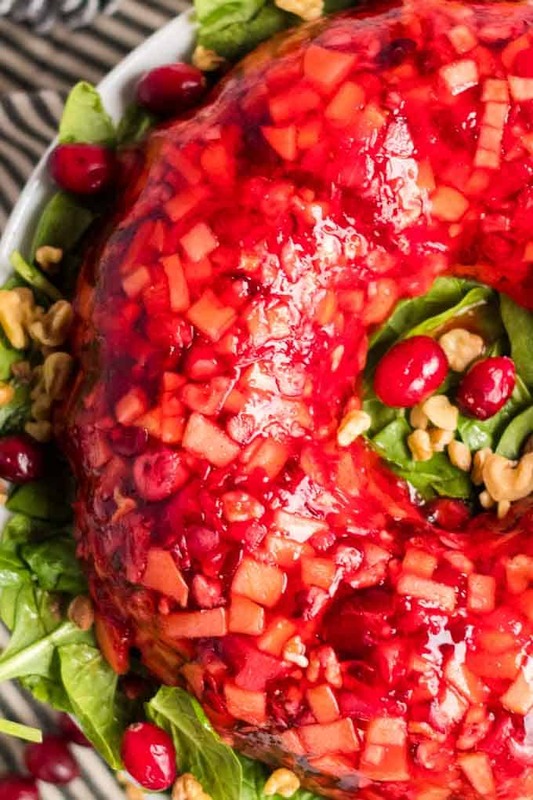 Cranberry Salad is the perfect addition for your big holiday dinner this year. 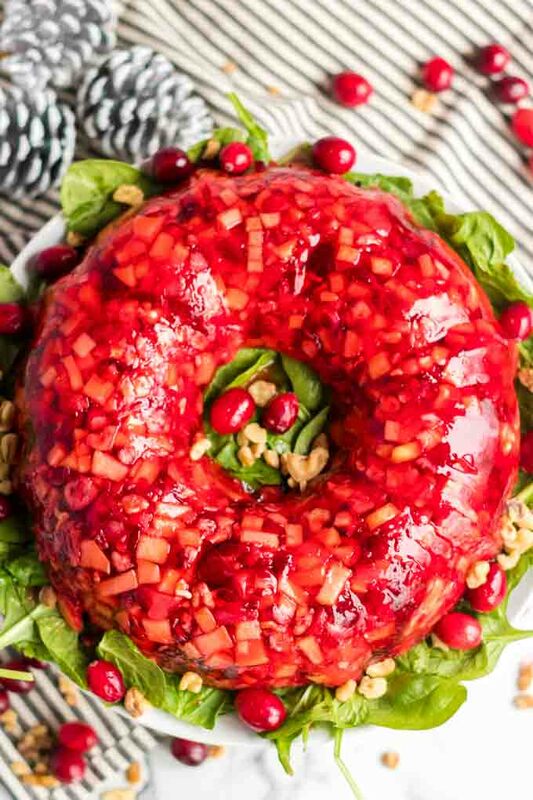 This easy jello salad is an edible wreath that will wow your guests and is sure to dominate your Christmas tablescape. 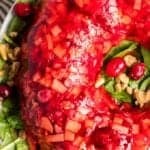 Cranberry Jello Salad is perfect for your holiday dinner menu. Our Cranberry Salad recipe comes to you from the Mennonite Community Cookbook. It’s the only cookbook that lived in the kitchen cupboard above my mom’s busy oven in our big Mennonite farmhouse. Cranberry Recipes are a holiday tradition in our family. 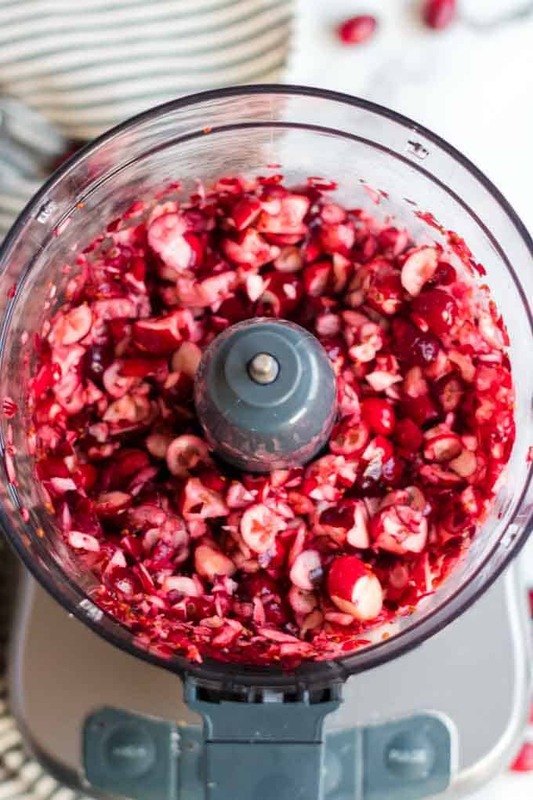 Start by chopping some fresh cranberries. After washing some fresh cranberries, you’re going to chop them up. A few pulses in a food processor works perfectly. Add some finely diced apples to the cranberries. Next, you will pare and core a few apples, then finely dice them and add to the fresh cranberries. 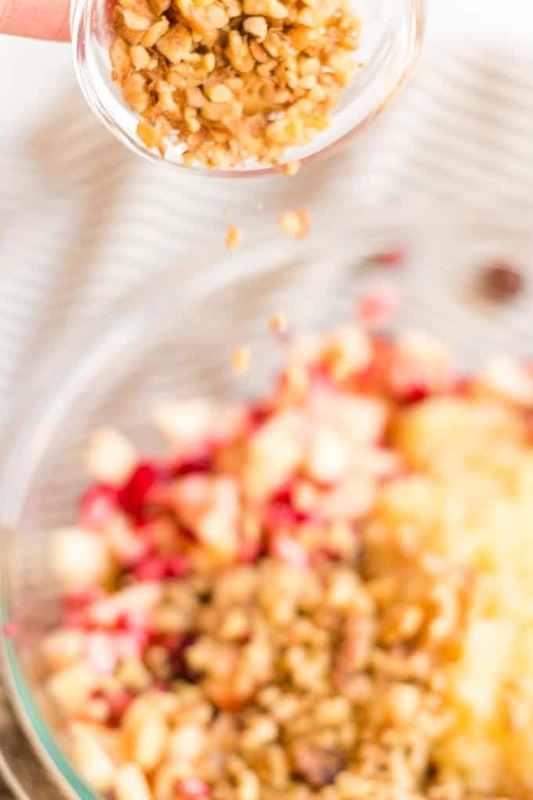 Chopped walnuts along with some oranges or crushed pineapple are added to this cranberry salad. 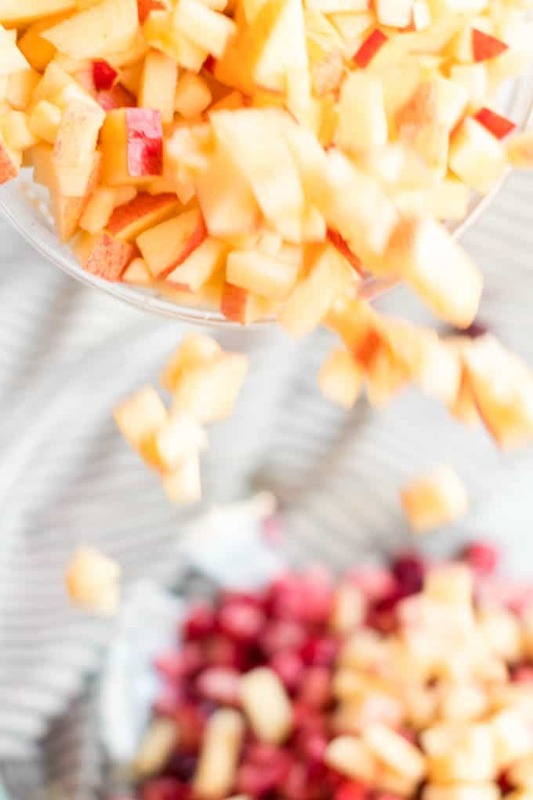 This cranberry jello salad takes a distinct holiday turn when you add some nuts and oranges (or pineapple) to the mix. Gelatin holds this jello salad together. 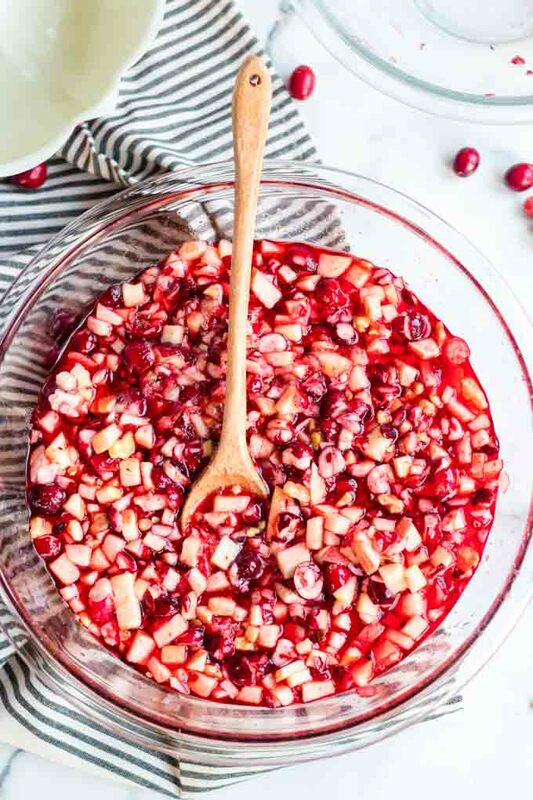 For this cranberry salad, you will dissolve a packet of either cherry gelatin or strawberry gelatin into a cup of hot water. Then, you will some cold water to the mixture and whisk it all together. Stir the cranberry mixture into the cooled gelatin. 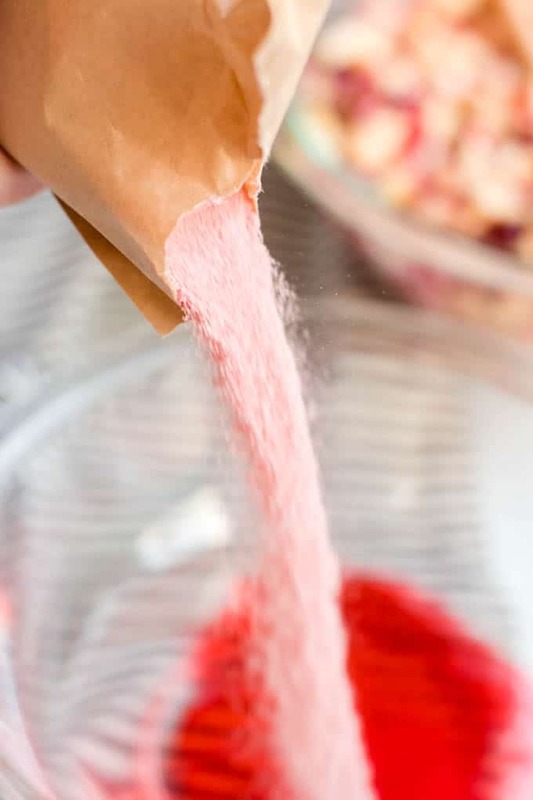 When the gelatin is cool, use a mixing bowl to combine it with the cranberry mixture. Gently fold it all together until it’s mixed well. The hot water needs to be boiling. Allow the gelatin to start to thicken a bit before combing the gelatin with the other ingredients. Be sure and follow the above steps or else the gelatin may not set. Pour the mixture into a salad mold. Now it’s time to pour the mixture for this cranberry salad into a salad mold and allow it to congeal. If you don’t have a salad mold, use a bundt can and just give it a quick spray with some non-stick cooking spray. 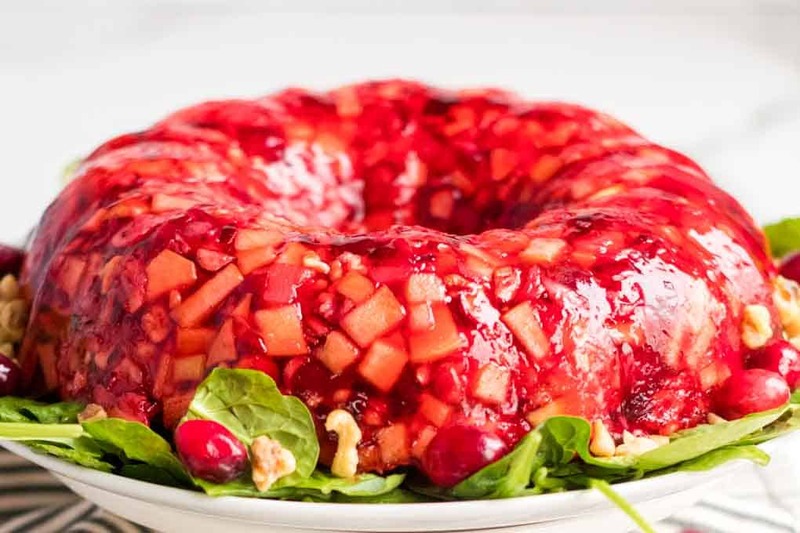 Allow the cranberry jello salad to completely cool before unmolding. 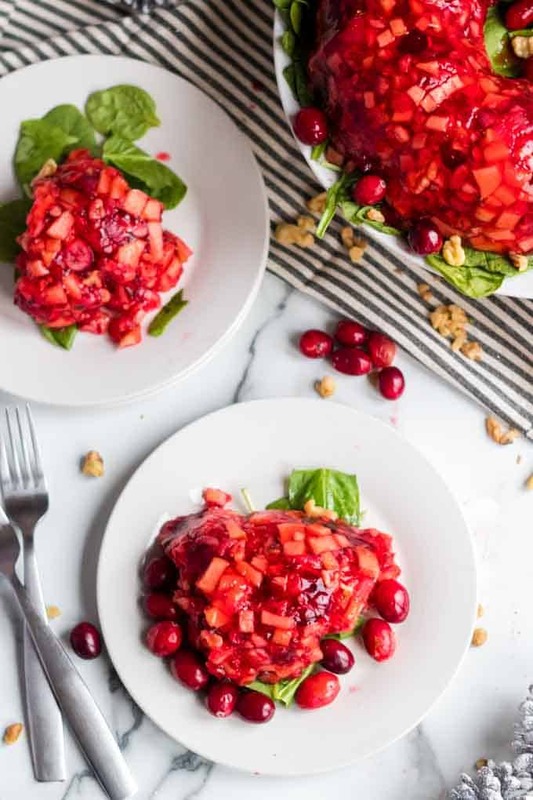 A bed of greens on the serving plate makes this cranberry salad the perfect bridge between a traditional salad and a holiday dessert for your Thanksgiving or Christmas dinner. 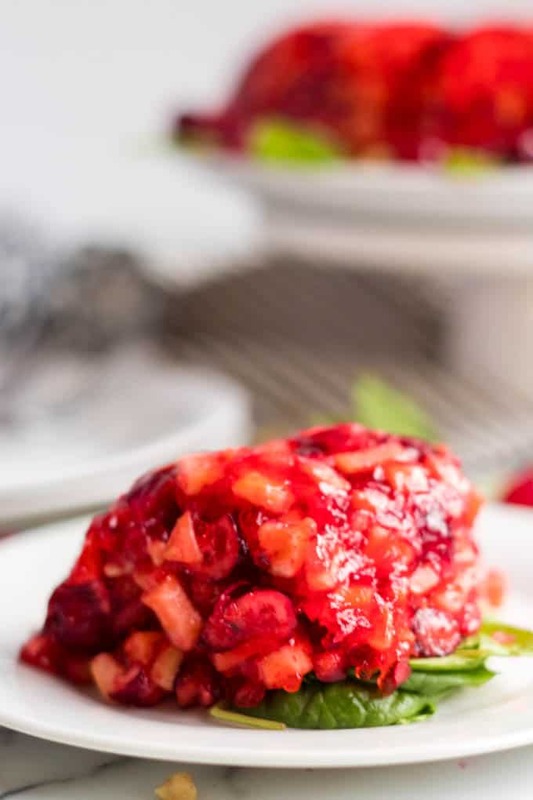 This cranberry jello salad is a great salad or light dessert for your holiday table. 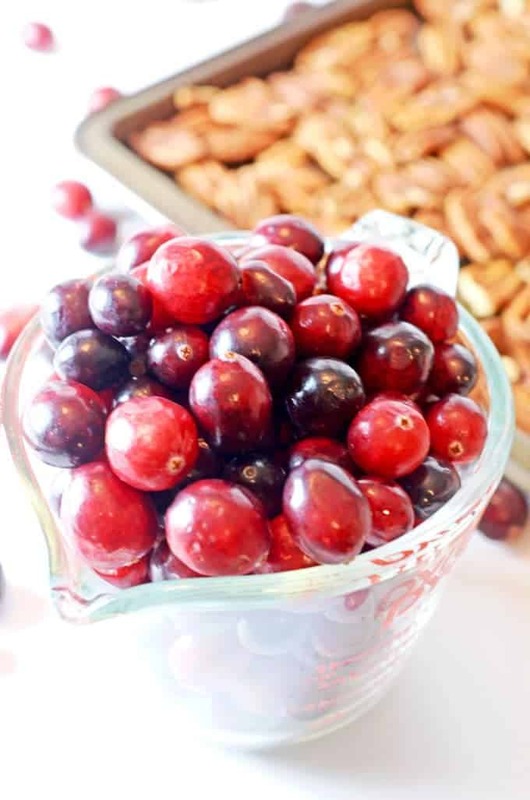 Read All About Cranberries from Platter Talk’s very own, Chef Kat. 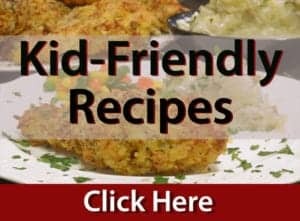 More Holiday and Christmas Salad Recipes for you to enjoy. 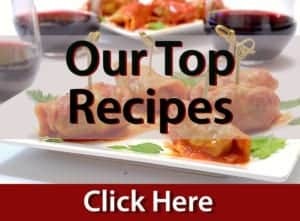 See some of our Mennonite recipes. 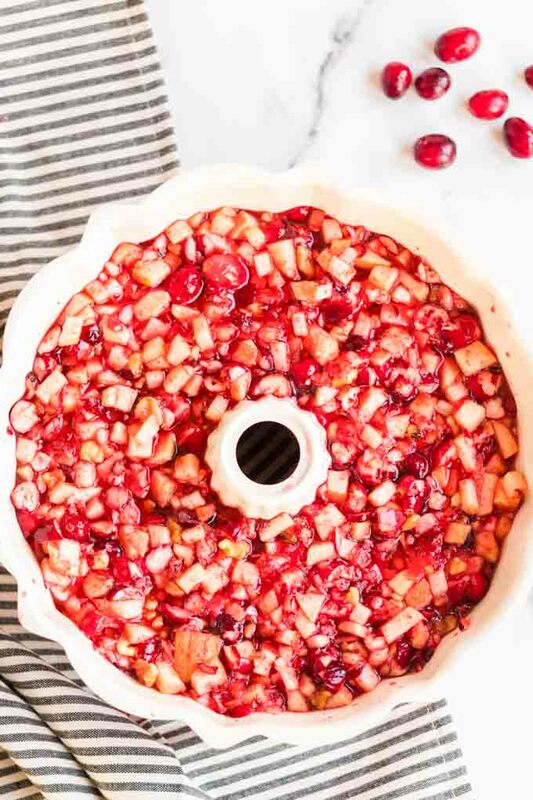 Pin this Cranberry Salad Recipe for Later. I have never seen a salad like this before. Absolutely stunning presentation and adore the use of fresh raw cranberries! Oh wow, that salad looks so beautifully festive and delicious! Jello salad with all the wonderful flavors, i’m sure you’ll get loads of appreciate for this salad from guests. This salad brings back so many memories! My sweet Mother-in-law would make this for all major holidays. The color is so festive and the fruit add just the right touch to go along with a heavier meal. Wow! How festive!!! Your pictures are SO enticing by the way. I think I just found my new dessert for Christmas. Thank you! This is so nostalgic from one Wisconsinite to another. 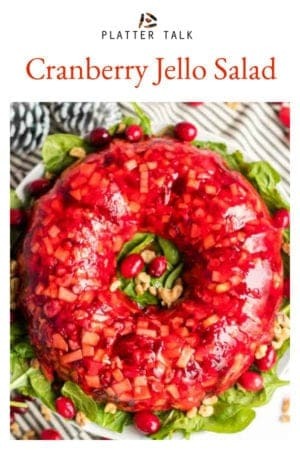 I think jello salad is a staple on most holiday tables. I love the cranberry version. I remember my grandmother had an orange one, but this sounds much tastier to me!